This 1880’s Victorian, mid-terrace house is nestled within a bustling small town just walking distance from Newcastle City Centre and 15 minutes from the Northumberland coastline. Our brief was to reinstate the original charm of the house whilst embracing modern living. We were to also create additional bedroom accommodation in the loft space and to re-plan the ground floor with additional space and new openings. A key element of the project was to harness natural light throughout where possible. To achieve this we introduced roof windows above stairwells, internal glazed panels between rooms and a glazed roof over a new rear breakfast room extension. The former rear yard has been transformed into an opulent, spacious courtyard for car parking and entertaining friends and family. The house itself has been completely re-worked and renovated. Mid-terrace properties often suffer from bad light and Larkspur was no exception. Now, upon entering you are welcomed by an invitation of light to the rear of the house. Here you’ll find the walled terrace through a window that is directly in line with the corridor. 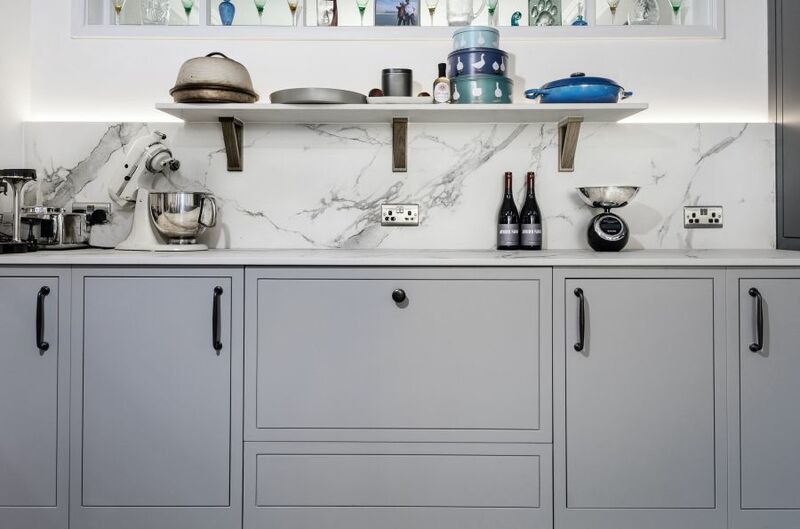 As you travel through this space with its Fired Earth tiling, you flow past the new under-stair WC and the stylishly subtle utility cupboards set in either side of the walls. Exploring the light further, we introduced a light tunnel on the first floor landing, glazed doors throughout the ground floor and an internal window from the living room to the centralised kitchen. This then leads to the glazed dining room so that there truly is an aspect of light throughout. Our client wanted to make Larkspur very much her own. 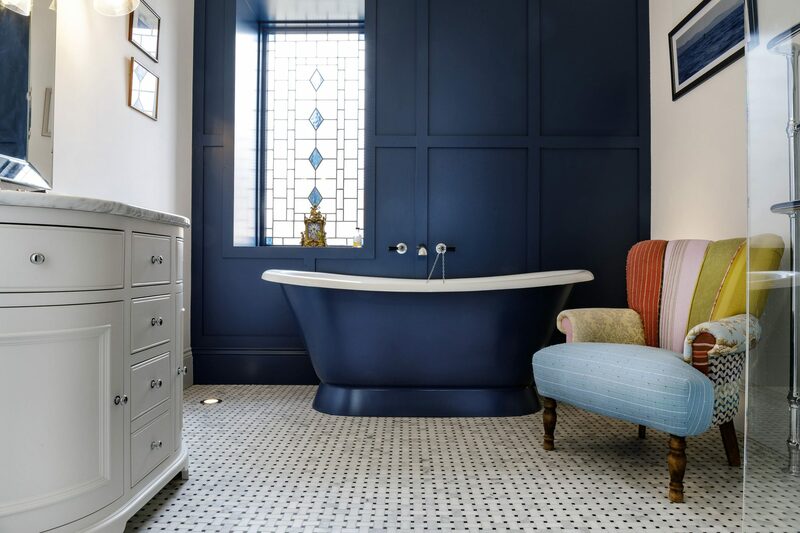 We worked closely together to develop all the spaces, integrating old family heirlooms with new vibrant colours and furniture, developing in particular the bathroom, master bedroom and kitchen with the client’s unique touches. The result: Larkspur has been transformed into a stunning new home in a grand old shell. “I first contacted Monument for architectural advice on a different property. But when I bought my new house, which required a complete overhaul including some structural work, I was very interested in all of their design and build services. Being a busy professional, I value the advice of experienced people who I can trust to handle the day to day worries of such a significant project. With Monument, from survey to architectural planning, regulatory approvals to the design and build, the whole process flowed smoothly. Everyone involved was informed and aligned so that my preferences and aims were always understood and met. Over several months, from property purchase to completion of the works, I had three primary contacts: the architect, the designer and the project manager. I found this delineation of the different roles and responsibilities to be very valuable throughout. For the build, the workmen were a mixture of Monument employees and external contractors, handpicked by Monument. They were reliable, pleasant, and extremely helpful and flexible. The attention to detail with which the work was done was excellent. I especially appreciated the weekly updates including pictures, regular detailed financial statements and a comprehensive and updated timeline. Looking back, it’s hard to imagine the work having been done without the team at Monument.